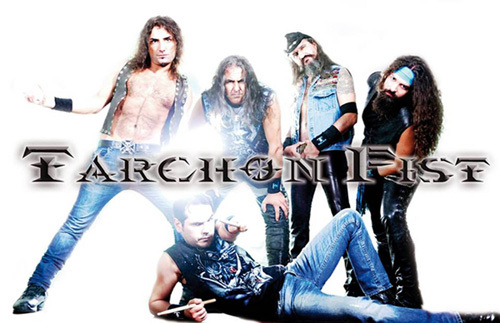 Here's another band that's been flying under my radar, Tarchon Fist. I haven't heard a thing from them in eight years. As far as I knew they were defunct, kaput, crapped out. But not so. These Italians have been marching with several new albums. Unfortunately, though it's being pitched as one, Celebration is not a "new" album. It's actually a compilation album of 12 previously released songs. To be fair, there is one new song, the title track. But, bottom line, Celebration is not a new album of new material, quite the contrary. And I don't generally review compilations or greatest shits albums. Yet, since I listened to the album anyway, a few words are in order. Brief words. 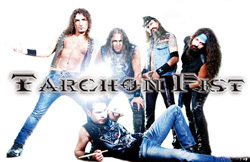 First, Tarchon Fist plays basic twin guitar melodic heavy and power metal of the New Wave of British Heavy Metal variety. Second, they're pretty darn good at it, too. Strong song arrangements with harmony and melody, swift rhythm section, clean vocals, and bunches of guitar solos. Third, something that's not known is whether the old songs the old ones or re-recordings by the band. Then some smart person might suggest that this is a "new" album after all. You all can quibble over that all by yourselves. Leave me out of it. Finally, instead of passing off old material as new, the band should have given us a complete album of new material. 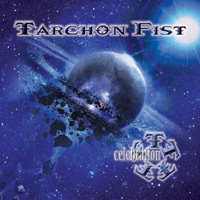 Otherwise, if you've never heard of Tarchon Fist and liked the heavy metal described above, then Celebration is a fine introduction to the band. Basically, excepting the title track, Celebration is not a "new" album of new material. It's a compilation. If like traditional NWoBHM-type heavy metal and you've never heard of Tarchon Fist, then this album is a fine introduction to the band.